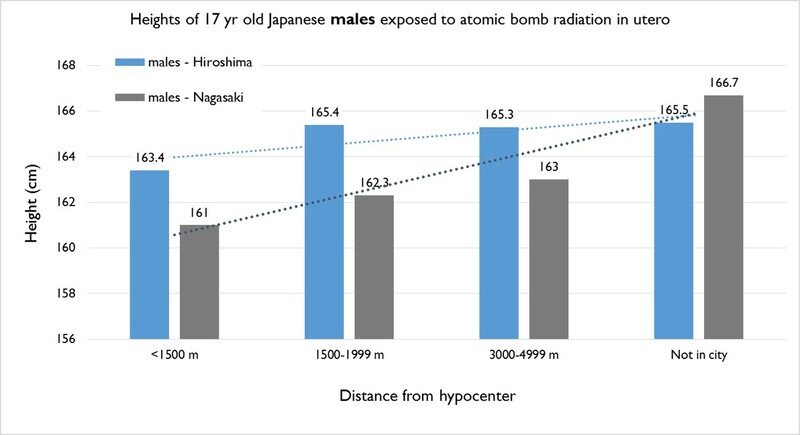 Did the Atomic Bombs in Hiroshima and Nagasaki Affect Child Growth? – Patrick F. Clarkin, Ph.D. 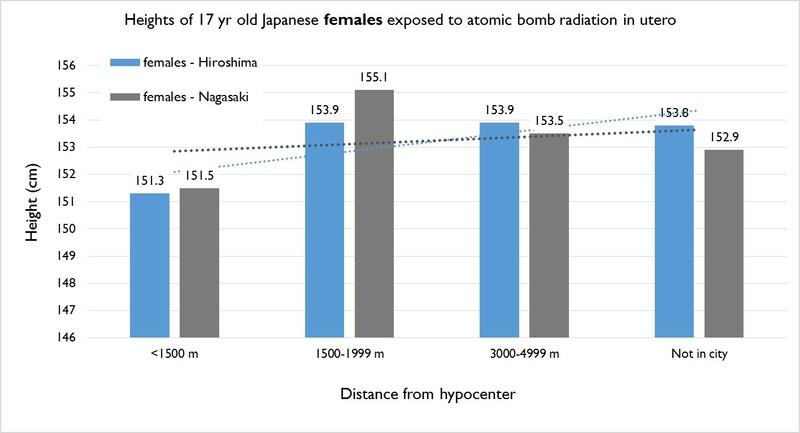 In 1967, James Wood and colleagues published a study on the growth of Japanese adolescents whose pregnant mothers were exposed to the atomic bombs in Hiroshima and Nagasaki years earlier. Of course, many people were killed by the bombs, although estimates vary somewhere between one and two hundred thousand in all. By one estimate, the mortality rate of people within one kilometer of the bomb’s hypocenter in Hiroshima was 86%. This rate dropped to 27% for people who were between 1 and 2.5 km, and to 2% for those between 2.5 and 5km. Comparable numbers were reported for Nagasaki: 88%, 34%, and 11% respectively. This study was about some of the survivors. 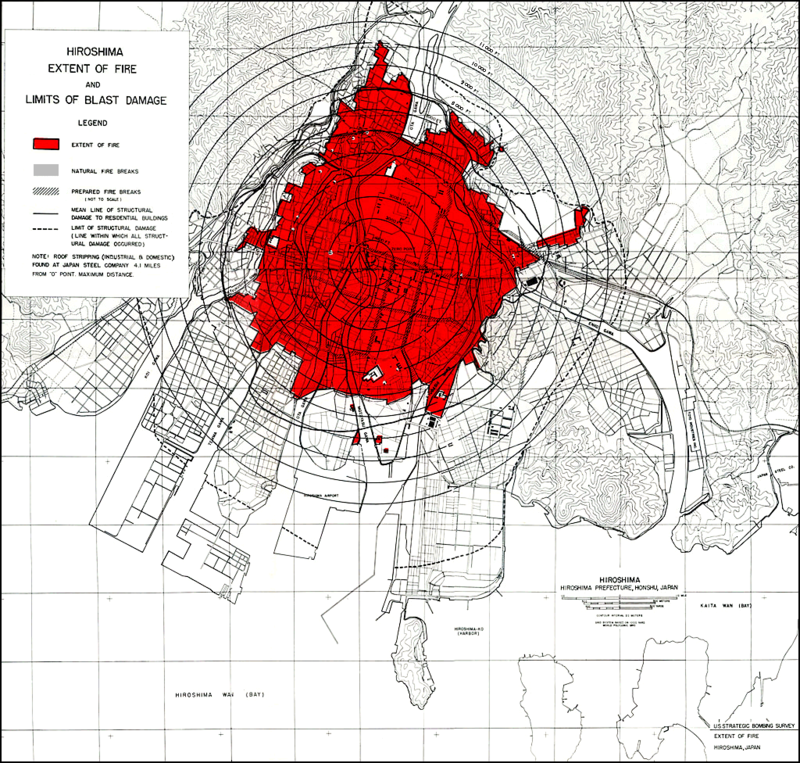 Hiroshima blast and fire damage, U.S. Strategic Bombing Survey map. From wikicommons. For example, Table 3 looked at growth attained at age 17 by distance from the hypocenters while in utero. Both males and females within 1500 meters were noticeably shorter. The trend appears to be stronger for Nagasaki, but sample sizes were much smaller than in the Hiroshima sample (in some of the sub-samples from Nagasaki, there were as few as 36 individuals), so there may more room for random effects. Data from Wood et al (1967). However, it is still not completely clear that the effects were due solely to prenatal exposure to radiation. For example, a more recent study on the growth of adolescents who were exposed prenatally to the fallout in Chernobyl found that there was no significant effect on stature (Neta et al 2014). I admit that I haven’t done all of my homework here and I don’t know enough about the effects of radiation, but in the case of Hiroshima and Nagasaki it seems plausible that the devastating damage to property, the likely loss of any family wealth from the bombs, and/or psychological stress could also have long-term effects on growth after birth. This doesn’t mean that radiation is harmless — far from it — but when it comes to growth and development, correlation is not necessarily causation. Basically, it is not so straightforward whether the effects on growth were due to prenatal exposure to radiation alone, or possibly to other postnatal environmental factors. It seems self-evident that an environment devastated by bombs, atomic or otherwise, would not present conditions conducive for a child to grow. For example, Mevlude Akbulut-Yuksel of Dalhousie University conducted an historical analysis on how physical growth of German children was affected by more ‘conventional’ Allied bombings in World War II. Her approach was a creative one, correlating adult stature with the level of regional destruction (measured in volume of rubble). Her conclusion was that Germans who were school-aged during WWII and who lived in regions with higher levels of destruction from bombing (primarily in the north and west) were about 0.6 inches shorter as adults. They also completed fewer years of schooling, reported lower satisfaction with their health, died younger, and had lower income. Perhaps the larger lesson is that war consistently creates a suite of conditions harmful to civilian lives, and that this shows up in bodies including in the way that children grow. In both of these cases from World War II, years had passed between the actual time of war (or even a cataclysmic event like an atomic bomb), and the time of measurement, but their effects remained embodied into adulthood. This entry was posted in Growth, Human growth, War and health and tagged Hiroshima, Nagasaki. Bookmark the permalink. While I suppose it is good that studies such as this take place, I find this one inconclusive and a bit confusing, particularly in comparison between the two cities. Also, I do not know what ‘not in city’ means. Reference to national average height of 17 year olds would seem to be essential. The main conclusion was that those exposed to the bomb within 1.5 km and who were ‘lucky’ enough to survive grew the worst. Outside of that distance, the effects were muddled. I went back through the study’s methods, and “not in city” isn’t defined very well. My best explanation would be that they were a control group whose mothers were outside of city limits at the time of the bomb. However, it does not say how far away they had to be to be placed in that grouping. They could be a motley collection of people from many parts of Japan, but my guess is that they were fairly close to Nagasaki and Hiroshima. True, a comparison to national standards would have helped. I don’t know of that comparison. There is another study that Japanese children were getting taller from the early 1900’s (nationally, not just in these 2 cities), but then it dropped off dramatically around WW2, after which it increased again.